- ✔ Media Library JukeBox mode meta-data scraping for Movie/TV/Music posters, backdrops, still images, title, description, genre, cast and more! - ✔ Media Library YouTube (Channels/Searches/Trends) integration. - ✔ Media Library RSS feed reader. - ✔ Media Library icons displaying the media format, video codec, video resolution, audio codec and audio channels. - ✔ Download subtitles through 'OpenSubtitles.org'. - ✔ Use XBOX 360 and compatible controllers as remote control with custom, user-assigned functionality. - ✔ Customizable actions when clicking 'Hot' screen corners (function/extended function/execute app). - ✔ Blu-Ray Decrypted Main-Movie Playback (with subtitles). - ✔ Automation user-selected action when connecting/disconnecting an additional monitor. - ✔ Automation user-selected action when detaching/attaching a "2 in 1" laptop's display. - ✔ Automation user-selected action when switching between tablet and mouse modes (win10). - ✔ Thumbnail preview when hovering with the mouse cursor over the timeline. - ✔ Fullscreen media center navigation Password protected categories. - ✔ Customizable Mouse Gestures. - ✔ Display chapters/bookmarks position directly on the timeline. - ✔ Media Scheduler with remote TCP/IP network based programming support. - ✔ Automatically restore the previously active subtitle track on replay. - ✔ Automatically restore the previously active audio track on replay. - ✔ Use Direct3D PixelShaders to enhance videos with macros to easily switch between shader script presets. - ✔ Use DirectShow filters directly from DLLs (without registering with OS). - ✔ Remotely create and manage playlists without affecting current playback. - ✔ Create Mobile-Phone RingTones from playing media. - ✔ GuardDog (Auto-Restart if the player locks up). 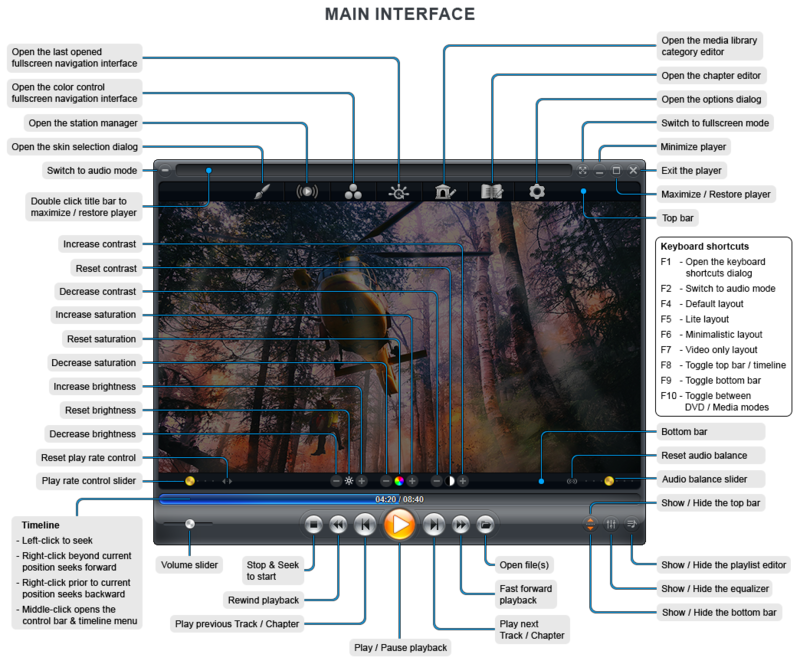 - ✔ Scene-Cut Interface (Dynamic, Virtual Audio/Video editing). - ✔ Video Wall (Span Videos across multiple monitors using the EVR Renderer). - ✔ Non-Linear 16:9/4:3 video scaling using EVR (Enhanced Video Renderer). - ✔ Support for Local Configuration file (easily run different configurations/instances on the same PC). - ✔ Video Orbiting (Prevents screen-burns). - ✔ Auto-Execute external programs Running/Closing the player. - ✔ Extended Command Lines "/x", "/y", "/w", "/h", "/nCols", "/nRows", "/Col", "/Row". - ✔ Extended Command Lines "/browse", "/func", "/exfunc", "/config", "/multinst", "/seek". - ✔ Extended Command Lines "/datapath", "/winname", "/connecttcp", "/sharepath". - ✔ Copy current play position to the clipboard. - ✔ Fullscreen media center navigation interface with easy to use controls for both Home Theater PCs (HTPC) and Tablets (or other touch devices). - ✔ Fullscreen media center navigation thumbnail view with kinetic smooth scrolling and customizable content-based layout. - ✔ Advanced Smart Play controls (Create your own Smart Play profiles, select & configure custom decoders for each media format). - ✔ Fullscreen media center navigation Safe Mode (hide dangerous functions from inexperienced users). - ✔ Fullscreen media center navigation custom background images. - ✔ Real-Time manual audio re-synchronization with optional initial synchronization value. - ✔ Communication & Control API (TCP/IP, WinAPI's SendMessage or COM), supported by many 3rd party applications. - ✔ Windows Media (WMV/WMA) DRM Support. - ✔ Playlist Power Manager (enhanced search/playlist manipulation). - ✔ Control Zoom Player through a Web Interface (web remote). - ✔ Audio Visualizations (Sonique, Windows Media Player plugin support). - ✔ Mouse Wheel Tilt (left/right) support with selectable functions (Windows VISTA or newer). - ✔ Custom mouse click & scroll functions. - ✔ Password protected options dialog, preventing other people using the computer from modifying your configuration. - ✔ Blank Secondary Monitors (when switching to fullscreen or by calling a function). - ✔ Automatic Audio and Subtitle media file stream selection. - ✔ Play History (Remember Date, Audio/Subtitle Track, Restore previous playback position and more). - ✔ Automatically restore volume level on replay with video files. - ✔ Automatically restore volume level on replay with audio files. - ✔ Share play history on a network path to resume playback from different machines. - ✔ Lock the On Screen Display to a region of the screen. - ✔ Auto-Execute external programs when a PAL/NTSC DVD disc is detected (prior to playing) and when the DVD playback is stopped. - ✔ Map network paths into the File Browsing Media Center navigation interface. - ✔ DVD Password Protected Parental Control. - ✔ DVD Trailers interface allowing you to play trailers prior to starting the movie. - ✔ Automatic Aspect Ratio, Video Size and Blanking depending on the DVD type (Fullscreen, Letterbox or Anamorphic). - ✔ Reload & Replay media files as they are being saved. - ✔ Closed Captions Support in Media Files. - ✔ Use any DirectShow filter as a custom Video Renderer. - ✔ Customize the functions assigned to keyboard navigation (up/down/left/right/enter & space keys). - ✔ Override the playlist editor's font with custom fonts. - ✔ Pattern Calibration System with White Wash Anti Burn-in mode. - ✔ Enhanced Screen Saver controls (Computer generated backgrounds, image slideshows and power saving modes). - ✔ Integrated eMule/uTorrent/qBittorrent file tracker (track download progress within the fullscreen navigation interfaces). - ✔ Customize the background image visible when nothing is playing. - ✔ Customize the background image used when playing audio when no folder image exists. - ✔ Add custom functions to the Task-Bar right-click menu (Windows 7 or better). - ✔ Extended Command Lines "/lockfs", "/tcp". - ✔ Create Contact Sheet (Thumbnail index). - ✔ Multiple Customizable Context Menus with extensive support for both DVD and Media modes. ✔ ✔ No bloat, intuitive interface with a user-friendly design. ✔ ✔ Skins for every resolution, including 4K screens. ✔ ✔ Install Center application, capable of detecting and securely installing up-to-date decoders, missing system components and language packs to improve stability and versatility. ✔ ✔ Support for legacy and cutting-edge Video Rendering technologies (Overlay, VMR7, VMR9, EVR, Haali, MadVR). ✔ ✔ Windows 7 (or better) Task-Bar position coloring. ✔ ✔ Windows 7 (or better) controls on the preview thumbnail (Mute, Play/Pause, Next/Previous Track). ✔ ✔ 10-Band Equalizer with Digital PreAmp and Presets. ✔ ✔ DVD Playback from Disc, Hard Drive or network connection. ✔ ✔ Quickly jump between multiple saved positions using media Chapters (or DVD Bookmarks). ✔ ✔ Go-To Interface to quickly and accurately seek into any position within a media file. ✔ ✔ Automatically Extract & Play Archived (zip/rar/7z/etc) content. ✔ ✔ Video Post-Processing (DeInterlacing, Sharpening, etc). ✔ ✔ Play incomplete AVI files. ✔ ✔ Play files locked by third party programs. ✔ ✔ Powerful, category based Media Library interface. ✔ ✔ Automatically play multi-part media files, including GoPro sequences. ✔ ✔ AB-Repeat (Repeat a section of the playing media in a loop). ✔ ✔ Choose from Multiple DVD Audio & Video decoders for improved compatibility and reliability. ✔ ✔ Smart DVD Bookmarking tool, including auto-loading bookmarks. ✔ ✔ Auto-Remember DVD position per-disc (each DVD's position saved separately). ✔ ✔ Multiple DVD play speeds with adjustable speed values. ✔ ✔ Preferred DVD language selection (Audio, Video, Subtitle and DVD Menus). ✔ ✔ Auto-Save definition file per-disc (remember Aspect Ratio Video Position, Color Values, etc). ✔ ✔ External DVD Subtitle Support (Use subtitles from an external file). ✔ ✔ Temporarily disable Auto-Play to prevent other programs from popping up when a DVD disc is inserted. ✔ ✔ DVD, Media, Audio and Media Center navigation skins. ✔ ✔ Advanced media format support (multiple language tracks, subtitles and chaptering in AVI, OGM, MKV and more). ✔ ✔ High resolution subtitle rendering on low resolution video using xySubFilter and MadVR. ✔ ✔ Integration with Windows VISTA's Media Library folders (auto-mapped to Zoom Player's media library). ✔ ✔ Start player window locked to Fullscreen mode (Hide the fact that your computer is your media center back-end). ✔ ✔ DXVA (hardware assisted) decoding with H.264 and VC1 video formats. ✔ ✔ Integrated image viewer (JPG/PNG/BMP) with Zoom, Panning and image-rotation functionality. ✔ ✔ High Quality Icon library containing extension-specific system icons (used when the Player is associated with a file format). ✔ ✔ Automatically load and display embedded/external background images when playing audio files (APE/FLAC/ID3/etc). ✔ ✔ Fullscreen Virtual Keyboard (used for renaming files from the fullscreen interfaces and elsewhere where appropriate). ✔ ✔ Extensive Playlist support ZPL/B4S/M3U/WPL (including native Unicode and UTF8 file names). ✔ ✔ Smart Play support (Faster loading files, no decoder conflicts and smoother playback on less powerful computers). ✔ ✔ Microsoft 'MMS' Audio/Video Streaming. ✔ ✔ Multi-Format video streaming of media files or live streams over HTTP. ✔ ✔ Definition system which saves and restores information on the playing media (Aspect Ratio/Color Values/etc). ✔ ✔ Easy access to popular filter interfaces such as XVID/H.264 dialogs, DirectVobSub language selection, etc. ✔ ✔ Fast Play support for most media formats (as long as your CPU can handle the extra load). ✔ ✔ Fast Forward and Rewind support with all media formats. ✔ ✔ User-Specified accelerated list scrolling speed (for large playlists and other content). ✔ ✔ Quick 'starting with' or 'containing' keyboard searches of large lists. ✔ ✔ Enhanced 'On Playlist Complete' setting, allowing control over what actions are taken when playback ends. ✔ ✔ ID3, APE, FLAC and WMA Tag information visualization. ✔ ✔ Virtual meta-data editor for both Audio and Video media files. ✔ ✔ 4 Level Zoom-In Toggle (16.6%, 13.3%, 50%, 100%). ✔ ✔ Windows Media Format 9 High Resolution Multi-Channel Audio Rendering. ✔ ✔ Auto-Play Media CD/USB/External drives. ✔ ✔ Bicubic, smooth scaled image slideshows. ✔ ✔ Easily associate any file format, including an icon navigation interface that allows you to easily decide which icon is used. ✔ ✔ Play random trailers before or after your Movies. ✔ ✔ Multilingual (Translated into multiple languages) with Unicode 16bit Character support. ✔ ✔ Basic and Advanced options dialog, making Zoom Player easy for new users while giving ultimate flexibility to power users. ✔ ✔ Mute audio while seeking. ✔ ✔ Automatic Skin-Mode Switching depending on type of content played (DVD/Media/Audio). ✔ ✔ Dynamic skinning engine with full support for color-tinting. ✔ ✔ Powerful Aspect Ratio controls, including support for non square pixels (Pixel Aspect Ratio), manual Fit-To-Specified-Area Aspect Ratio, Anamorphic Aspect Ratio and even a Custom user-specified ratio. ✔ ✔ Easy control of Video Size and Positioning while in fullscreen, allowing you to position the video anywhere and at any size on screen. ✔ ✔ Fully keyboard mapped features and dialogs, covering every function used by the player (useful with Remote Control, keyboard devices and HTPC systems). ✔ ✔ Programmable keyboard editor, including support for chaining multiple functions to one key and Global Hot-Keys (keys that work even when the player is not focused). ✔ ✔ Advanced mouse controls with customizable functions, including a wide array of mouse-wheel supported features (extremely useful with HTPC systems). ✔ ✔ Custom Video Position, Aspect Ratios, Color Control and Image Blanking presets. ✔ ✔ Dynamic Control Bar, providing easy navigation while in full screen mode, complete with user-selected on-bar functions. ✔ ✔ Detachable Control Bar, allowing you to easily control player functionality from a secondary monitor. ✔ ✔ 4xSpeed seeking (short/medium/long/very long) with customizable speeds for quickly seeking forward/backward within the playing media. ✔ ✔ Extensive command line support. ✔ ✔ Override the system-default Audio Output device and assign output to any other audio device on the system. ✔ ✔ User specified registry location, supporting multiple running copies of the player using different configuration profiles. ✔ ✔ Web URL Navigation system, allowing you to associate DVD and Media files with a URL or local information file. ✔ ✔ Fully Multi-Monitor compliant with powerful multi-monitor features. ✔ ✔ Multiple Skin-Modes within a single skin (default/small/minmalistic/frame-only/etc). ✔ ✔ Docking user interface elements to Window Borders and Advanced Magnetic Docking capabilities. 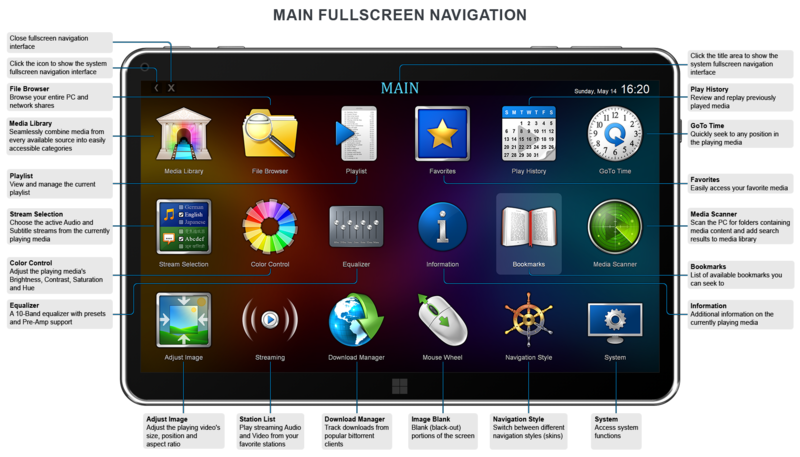 ✔ ✔ Translucent user interface (Requires Windows Vista or newer with the Aero interface enabled). ✔ ✔ DVB Support using DCoder's DC-DVB filter, including tuning and time shifting. ✔ ✔ Change screen resolution when going into fullscreen and restore when leaving fullscreen. ✔ ✔ Screenshot support in JPG, PNG and BMP formats. ✔ ✔ LIRC Remote Control support. ✔ ✔ Shortcut File Parsing for easy redirection of DVD and Media content from a centralized location. ✔ ✔ Blanking feature used to cover up non-black area of encoded Video (useful when playing widescreen DVDs or badly encoded media files). ✔ ✔ Girder Command file export for maximum control through a remote device and System Automation. ✔ ✔ Full support for GraphEdit ".GRF" files. ✔ ✔ Backward (Windows 98) and Forward compatible with all versions of windows running on Intel processors.